Last month Paloma started a Personal Style, Defined series. Its a brilliant idea as everyone loves to see how other bloggers designed their own personal space. So, if you have not checked out La Dolce Vita, Decorum, OR any of brilliant installments of Personal Style, Defined then you must go to check them out. Lamp- Anything by Visual Comfort available at Circa Lighting. 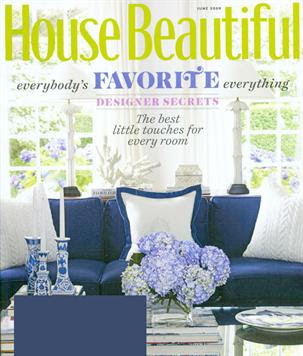 They have such a gorgeous selection that it is hard to choose just one, but I would have to say that my current favorite is Suzanne Kasler’s Quatrefoil floor lamp, which I have in my family room. Everyday dishes- I prefer white dishes so that the food can stand out and be the true centerpiece. Everyday glassware- I have streamlined glasses with thick bases. I really like the look and the fact that the mouth is wider than the base. 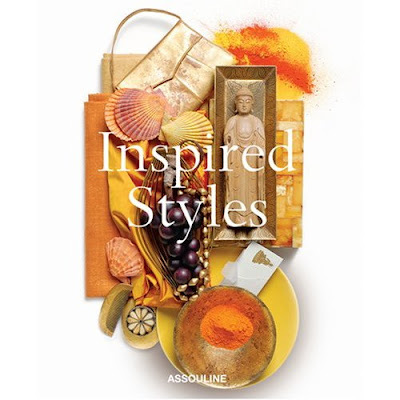 Design book- There are so many, but I really love Inspired Styles because it is a veritable scrapbook of designer favorites and sources of inspiration. Cleaning supply- Folex Carpet Cleaner: It works on everything and you can use it to pre-treat clothes, too. I also really like Method's products. Fabric- This is a tough one! I think it depends on the application, really. 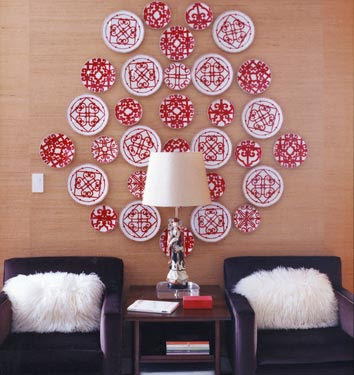 I still really love Donghia’s Suzani and David Hicks’ La Fiorentina will always be a favorite. Color- I am horrible at picking favorites because I can never narrow it down! I really love grey, soft shades of turquoise, and Kelly green, but not all together. Accessory- I have a wooden bangle with some brass circles that I seem to wear an awful lot. Nail polish color- Bubble Bath by OPI: It is the perfect pale pink neutral and is also a favorite of Giada de Laurentiis. 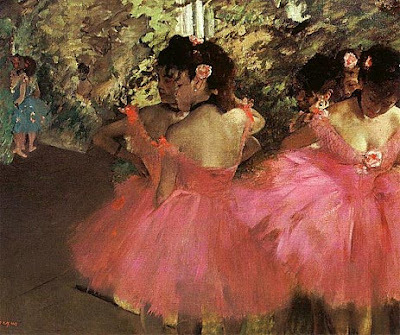 Artist- Pablo Picasso for his vision and for being a consummate artist. Frida Kahlo is a favorite because of her passion and the emotion in her paintings. I love Edgar Dégas’ dancers for their beauty and think Beatriz Milhazes is a great contemporary painter. See? I told you I couldn’t narrow it down! Alcoholic drink- I don’t drink alcohol very often, but I do enjoyed a full-bodied red wine like a Spanish Rioja or a Merlot or a good mojito from time to time. Writing utensil- Uni-ball Vision: I like the pretty colors, but I think my handwriting looks best when I use a plain ball point pen. Stationery- I just bought some really pretty note cards from Ana Stella on Etsy. Pair of jeans- J. Crew High Heel Flare, which I am afraid have been discontinued! Just my luck! Heels / flats- It depends on the day and my mood. Room to decorate- Living/ Family Room since most people spend the bulk of their time there. Designer- This is really difficult because I like so many different styles, but I would say a few of my favorites are David Jimenez, Angie Hranowsky, Amanda Nisbet, and Michele Bonan. Organizational tool- My Post-Its for making to-do lists. I usually have a few plastered all over my desk. Chair- Right now, the vintage 1950’s chairs my husband and I made over. Handbag- Hermès Birkin…maybe some day! Towels- I don’t have a favorite brand, but I look for towels that feel nice to the touch. I also happen to prefer white towels over anything else. I think they look the most crisp. 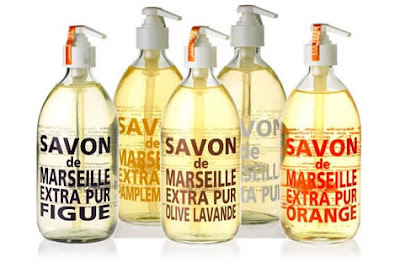 Soap- Savon de Marseille: All of the scents are intoxicating! I love them. 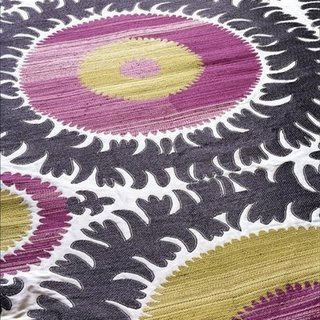 Current Trend- I feel like people are taking more risks with color, which is fantastic! I hope you all enjoyed the 4th round of Blogger's Favorite Everything. Paloma, thank you again for taking the time to share your favorites with everyone! How fun...great favorites - I can relate. i love this series! you pic all my fav bloggers!! this is so cool - such good questions, and a great post!!! Great idea! I love this...It's nice to get to know everybody! Great post! I love those jeans!!! Oh I love Paloma! I enjoyed seeing her favorite things! This is a great idea! Love so many of Paloma's faves too. 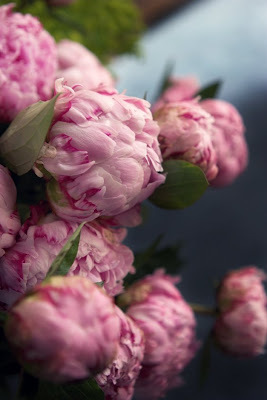 What a wonderful blog. Another good one! I think I need that soap now just because of the super cool bottle it comes in! such a great series!! love paloma's chair redo!!! this is a really great series. i LOVE that lamp and the imperial trellis wallpaper is one of my faves too. and i must try those method products - i hear such good things about the. so fun. Love, love those chairs. Great post! Can't wait to see who is next! That looks great! Spacify offers wide range of modern floor lamp for your home.